Construction Sealants Market size was above USD 4.5 billion in 2016 and industry expects consumption of over 700 kilo tons by 2024. Increasing application scope in residential & public infrastructure mainly in India and China owing to low VOC content, corrosion resistance, adhesion insolubility along with compliance to green building norms should drive construction sealants market size. China construction spending was over USD 1.5 trillion in 2014. Sealants are semi- solid chemicals which are widely used in construction industry to block dust, sound, heat and fluid through apertures at the joints in the building structure. It also provides longer life span, waterproofing, reliability to building construction. Rising living standards along with easy financial assistance has led to increase in residential construction and renovation projects which is likely to drive construction sealant market demand. Global construction spending was at over USD 9 trillion in 2014 and poised to surpass USD 11.5 trillion by 2020. Construction sealants prevents building structure from rain and airborne contaminants thus enhancing structural strength and increasing longevity. Growth in demand for high strength and durable public infrastructures prominently in India and China may act as another contributing factor towards construction sealants market demand. Growing investments in research to develop energy smart construction projects should have positive impact on industry growth. Positive outlook in development of bio based sealants by using natural oil based polyols along with renewable resource technology which offers high performance, improved water resistance, good adhesion and high flexibility may favor construction sealants market size. Stringent environmental policies in Europe and U.S. regarding toxicity and emission may limit industry profitability. However, manufacturers focus and adoption towards bio based sealants which may reduce environmental impact should fuel product demand. Key raw materials used in manufacturing includes silicones and polyurethane. Volatility raw material prices due to wide unstable crude oil prices accompanied with wide application across other industries including electronics, automotive, and packaging industries likely to affect raw material availability and thereby impacting construction sealants market price trends. Construction application based Silicone sealants market size is poised to surpass USD 3.1 billion in sales up to 2024. It provides high strength, long lasting, excellent durability, flexibility unique UV and moisture resistance along with compliance to green building norms. Environment conscious consumers inclination towards green construction materials with additional qualities may positively favor construction sealants market growth. Butyls based construction sealants may witness significant gains at over 3 %. It provides non-hardening, non-skinning and flexible sealing with limited sound permeability and vapor barriers. Strong application outlook in all types of masonry, glass and steel to provide long lasting seals should boost product demand. Construction sealants market size from structural glazing application may exceed to USD 3 billion by 2024. It provides ease of application on glass, aluminum, windows, safety user friendly dispensing and cost effectiveness. Shifting trend towards modern construction with better aesthetics owing to rising economic standards has promoted increase in use of structural glazing in buildings which should stimulate product demand. 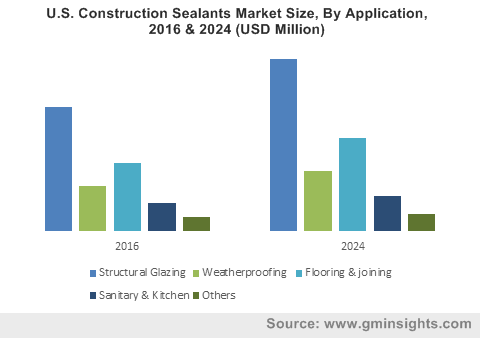 Construction sealants market size from flooring & joining applications may register gains at over 4% at the end of 2024. These sealants provide high mechanical resistance, moisture vapor barriers, compatibility with other construction materials and ease of application. Increasing demand for durable heavy-duty sealants for public infrastructure building might drive industry growth. Asia Pacific led by India, Japan, China construction sealants market size, may surpass USD 2.5 billion at end of 2024. Growth in infrastructural spending owing to availability of financial assistance supported by huge investments in infrastructure projects should have positive influence on regional industry growth. Germany construction sealant market may witness significant gains at over 3.5%. Stringent environmental policies by EU Commission pertaining to VOC emission and toxicity of building materials has led to adoption of ecofriendly bio based materials thereby promoting regional product demand. Brazil construction sealants market may witness strong gains owing to growing population and rapid urbanization along with increase in construction of commercial infrastructure should favor product demand in this region. Global construction sealants market share is competitive and moderately consolidated with major players operating in the market which include H.B. Fuller, Sika AG, 3M, and Dow Corning. Other prominent players present in the market include Wacker Chemie, Bostik, Pecora Corporation and Tremco. Companies are developing technologies to develop sealants from bio based resources with renewable technologies. They are also focusing on diversifying their product range and capacity expansion to widen regional presence. Construction sealants are viscous and semisolid building materials which are used to block heat, dust, sound and fluid through joints. It comprises of inert filling material along with elastomer and provides acoustics and thermal insulation accompanied with fire barrier. Key properties include waterproofing, temperature & chemical stability, flexibility, weather resistance and long life. Growing demand for durable, reliable and eco-friendly building material should drive construction sealants market size.